It has invested $7b in Fibre-to-the-Desk infrastructure, serving 90% of business customers in Hong Kong. For over two decades, WTT HK Limited (WTT) has established itself as a top telecommunication and ICT services provider in Hong Kong. The company’s best-of-breed solutions have earned the trust of various clients across a range of industries, becoming the trusted business partner of all listed financial institutes in the Hang Sang Finance Index, the Top 10 Global Investment banks, and over 90% of all HKSAR government departments. WTT has invested a whopping HKD 7 billion to create the ultra-high speed Fibre-to-the-Desk network infrastructure, serving 90% business customers in Hong Kong. WTT’s quest to be a bellwether in ICT services began in 2006, when the company started assisting corporations as well as small and medium enterprises as they reinvent themselves for the 21st century. It is no wonder, then, that WTT has since 2010 become known for being an effective cloud enabler and information security enhancer for businesses in Hong Kong. In 2017, WTT enables businesses to take advantages of AWS cloud to build sophisticated applications with increased flexibility, scalability and reliability with the launch of AWS Cloud Enablement Services. The flagship service is now serving hundreds of thousands of customers who are on a mission to innovate their businesses. 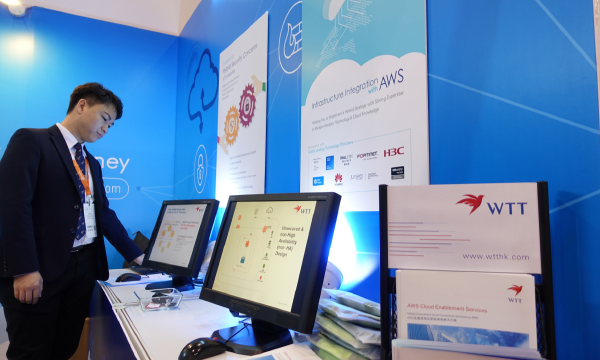 WTT helps its customers to build, migrate, and design the cloud architecture of their choice – all while providing a reliable fibre broadband network with direct connection to the AWS Cloud. At AWS re:Invent 2018 in Las Vegas, WTT became the pioneer top achiever from Hong Kong to attain the AWS Well-Architected Partner recognition for its competence in helping enterprises to build secure, reliable and cost-optimized cloud platforms. Only less than 1% of global AWS Partner Network (APN) partners, to be exact, 34 out of over 10,000 worldwide partners had achieved this in the debut partner program. Included in WTT’s list of laurels is the APN Advanced Consulting Partner status attained in a record-breaking 9-month elapse, followed by the AWS 50 Certified recognition, indicating the number of AWS certifications WTT talents have secured. But cloud services, however, is not the only strength of WTT. The company has also made a name for itself in the realm of data security. WTT understands that cybersecurity has become one of the top priorities for businesses today. Most corporations give executives access to critical company data through smart devices, which may not have the necessary firewalls to keep the company secrets safe. The threat of cyber attacks is real, with businesses vulnerable to ransomware, distributed denial-of-service, phishing, and malware. This is where WTT’s expertise lies: It provides professional cybersecurity experts so companies can combat professional hackers. WTT’s high customisable, easy-to-start- and all-inclusive Asure Security was created to give companies the power to design the best form of cybersecurity that their businesses deserve. Asure Security brings together a diverse set of technologies and domain expertise from different sectors, all with the goal of building highly secure environments for enterprises. With WTT’s latest ePayment partnership, its clients are able to use Alipay for a wide range of retail industry needs, including a 24/7 after sales support that allows them to focus on building their profits while leaving all the technical work to WTT. Over the years, WTT has showcased its cross-sector knowledge on ICT and cloud solutions, enabling the comapny to design and create customised ICT services for its customers. Customer services topnotch, with WTT constantly striving to uphold its “Winning Together” motto in every transaction. It is this mindset that has led WTT to grow its loyal customer base, which now includes over 56,000 clients across small, medium, and large-scale enterprises. WTT, however, remains relentless in its drive to be at the top of the game. The company envisions a future with a rising popularity of managed and one-stop-shop ICT services. Businesses will focus more on their operations and leave ICT service management to professional service providers. How will WTT stand out? By carrying on itsdiversified strength from business broadband to various business-centric ICT offerings such as cloud and security, WTT is in a strong position to welcome a new and exciting chapter in its business operations.